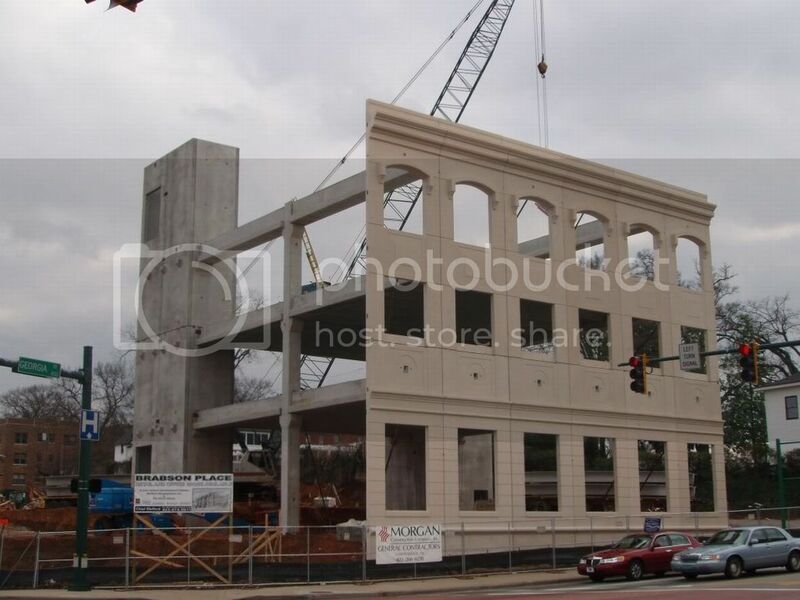 Here's some construction pictures I took in the downtown Chattanooga area on January 6th. There's quite a lot of good things in the works here. Two North Shore. This is a retail and grocery store project located directly across the street from the 200 unit One North Shore condo project on Chattanooga North Shore district. One North Shore. Construction is just beginning on this project. 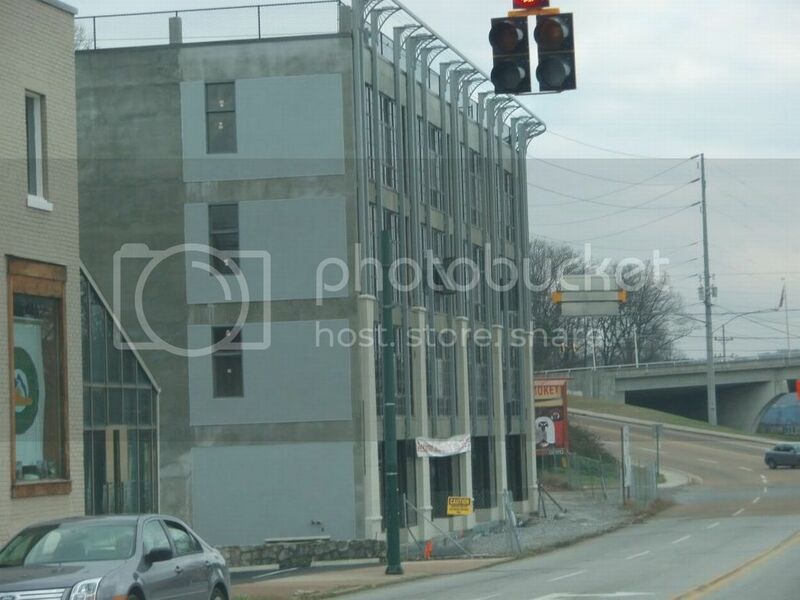 It's the largest condo project in Chattanooga with 200 units in a seven story building. 417 Frazier. 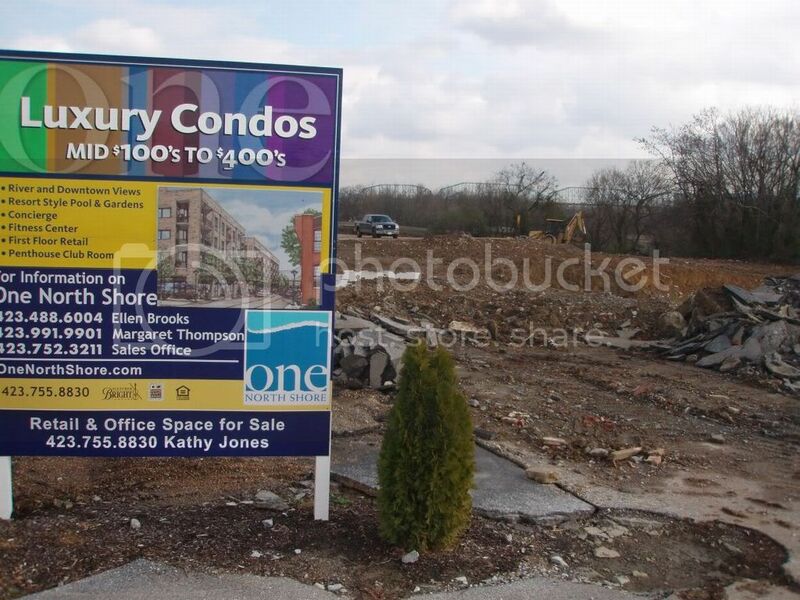 This is another condo project on Chattanooga's North Shore. It is nearing completion. Brabson Place. Located at the corner of Georgia Ave and 4th St, it is located at the edge of the Arts Bluff District. This is a mixed use, office and retail project with about 56,000 Sq Ft.
Museum Bluffs II and Blue Cross Blue Shield Corporate Headquarters. 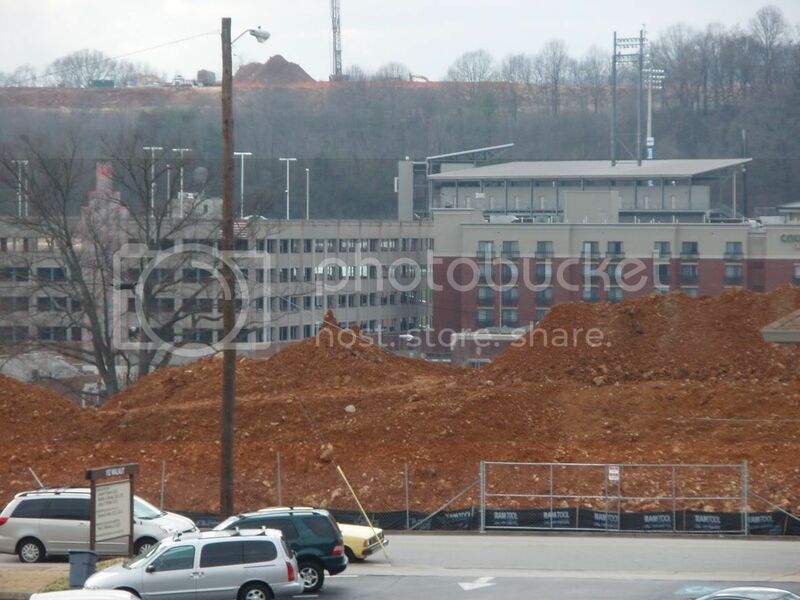 The large mound of dirt in the foreground is construction on Museum Bluffs II (more about this one later). The construction on the hill in the background is on the massive Tennessee Blue Cross Blue Sheild corporate headquarters project. 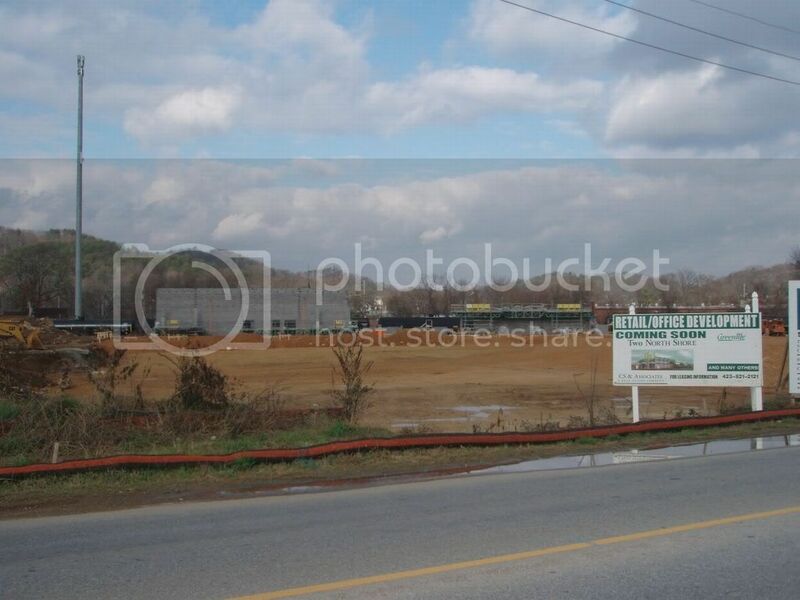 This will be a 950,000 Sq Ft office complex built in five separate five story buildings on the top of this hill. Museum Bluff I. Just completed. The pedestrian walkway you see runs between the Tennessee Aquarium and the Hunter Museum. 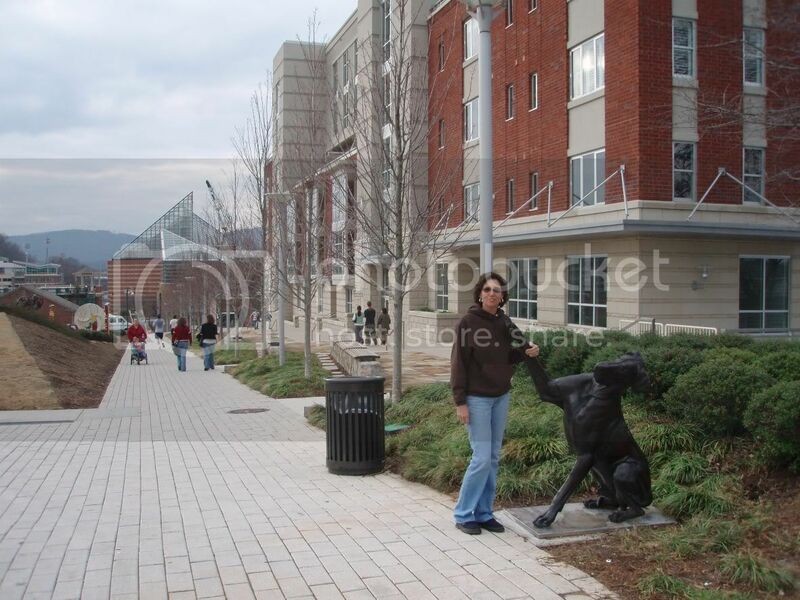 Many new art pieces have been added recently such as the dog in this picture. It's a great urban space. The walkway will run in between Museum Bluffs I and Museum Bluffs II. Museum Bluffs II. 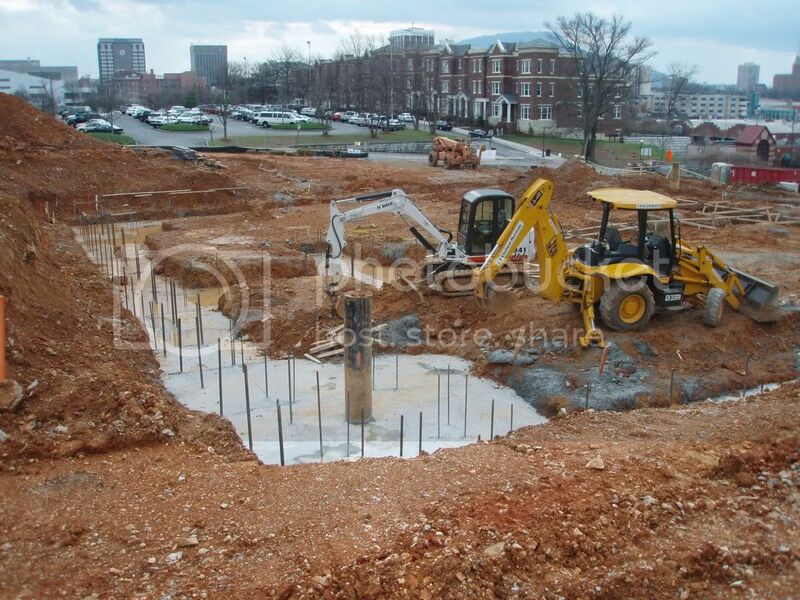 This is a 107 unit condo complex that has just begun construction in the Arts Bluff District. It is located directly across from Museum Bluffs I. Great pictures. The North Shore is a good example of a City doing it right. A high rise condo over there, facing the river, skyline and Lookout Mt would be a real winner. I like those pre-fab sidings being installed on the Brabson Place. In lieue of extremely expensive (thus economically prohibitive) handmade craftsmanship, these will do just fine. BTW, did I read you were getting married? If so, why are you out taking pictures? Great to see all the construction going on in Chattanooga. The city is finally getting the recognition it deserves. The corporate HQ's is HUGE! Next time I'm in Chattanooga I am going to have to check-it all out! I can't wait to see the redeveloped riverfront area. Great pictures. And who is that pretty little lady leaning on the dog? That's getting close. Are you excited? Dose Chattanooga have a building height limit on downtown buildings? In the central business district I do not think there is a height limt. Currently the tallest is 20 stories, and there at about 20 buildings 12 stories or above. In seems of late all the new construction has been midrise. I do know that many areas outside the central business district but still in the downtown area have building height restrictions. The North Shore area is generally at 4 floors. However, the North Shore One project was approved for seven. Areas south of the CDB are also generally limited to about 4 stories. There is a height restriction that I'm aware of for the CBD. The tallest building ever proposed for Chattanooga (that I know of) was approx 30 stories. It would have been built where the new EPB HQ is. (Butcher Block) It would have housed the Chattanooga offices for a bank (Knoxville based?) Maybe someone remembers more details than I do. The tallest is the Republic Centre. I used to work there, but 21 stories comes to mind. The official height of the Republic Center roof is 250ft, the top of the penthouse is 275ft. Here is a pic from the roof (~250ft) that I took a couple years ago. When will the population Statistics be available for Chattanooga 2006?